After their discovery, they were transported by rail all over the country. According to Samuel Lothrop, who recorded the total amount of spheres in 1963, they reached the number of 186. Nevertheless, several hundreds of them had already been dispersed to various locations throughout the country, which means that they must have been even many more. The Diquis Spheres were likely made by the indigenous population (fishermen, hunters and farmers) through a combination of controlled fracture, pecking, and grinding. The may have been manufactured any time within a period of 1800 years. 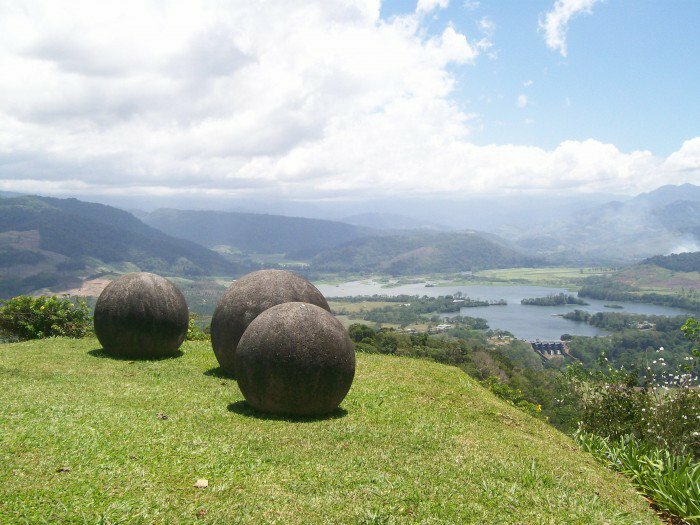 They are connected to a pottery type associated to iron tools of the Colonial period and several Pre-Columbian cultures of southern Costa Rica. Although they present pottery characteristics of the Aguas Buenas culture (200 B.C. to 800 A.D.), similar spheres have been unearthed from burials that date back to 1000 A.D. The first spheres were possibly used by various generations and as a result they were moved and modified several times. Although the first major study on the Diquis Spheres was conducted in the 1950s, their use still remains unknown. A large number of spheres were found in alignments of triangles, parallelograms, straight and curved lines. Four spheres were arranged in a line that was oriented to magnetic north. Based on that, there were speculations that the spheres were connected to magnetic compasses or astronomical alignments. However, these arrangements were destroyed when the spheres were moved from their locations. Unlike the stone balls in Jalisco, Mexico, the Diquis Spheres are not natural but handmade. Their vast majority is made of granodiorite, a hard, igneous stone taken from the foothills of Talamanca range. Few of them are made of coquina, a hard material similar to limestone. Their diameter ranks from a few centimeters to over two meters, which weigh over 16 tons and they are all nearly perfect in roundness. Today, the Diquis Spheres decorate official buildings, hospitals, schools, museums as well the homes and gardens of the rich and powerful as an indication of a certain status. Two of them are placed on public display in the U.S., one in the museum of the National Geographic Society in Washington D.C. and another one near the Peabody Museum of Archaeology and Ethnography, at Harvard University in Massachusetts.